What Is Lab Simulator and the Features of A+ lab simulator? The software A+ Lab Simulator comes with several ready made labs and provides hands-on experience for candidates intending to prepare for A+ certification,Several lab exercises are made available with the lab simulator. Lab exercises -currently 50+ labs are included. Demo version is limited to a fewer labs, and up to global configuration mode is supported in demo version. 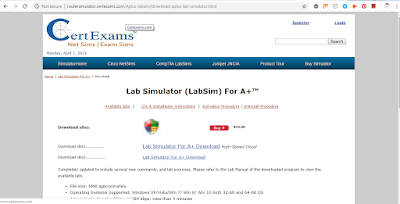 You may Download the Lab Simulator For A+ Completely updated to include several new commands, and lab exercises.Lab Manual of the downloaded program to view the available labs. Re: What Is Lab Simulator and the Features of A+ lab simulator?